A while back I showed you how to match your skin tone using a mere 4 components. Today, we're going to use that foundation color to create a collection of skin tones – from highlighter to blush to contouring. Here's the coolest part: you're only going to need one additional pigment to make an entire palette of skin tone sculpting colors. Making a highlighter is the easiest thing on the planet (seriously). 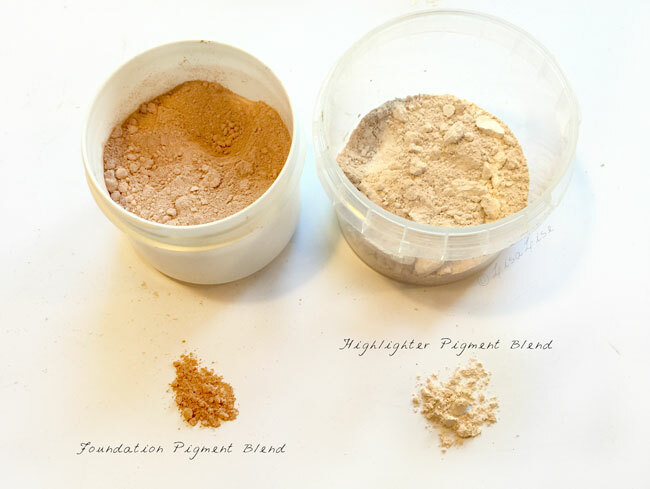 It is simply a question of adding more white to your foundation mix. Start with 7 parts white to 1 part color. Mix foundation pigment blend with white pigment thoroughly in your handy dandy whizzing apparatus, adjusting the color as you go. My highlighter (pictured here) is 10 parts white to 1 part foundation mix. Creating the perfect blush and lip color is the next easiest thing on the planet (seriously). Here's where the additional pigment comes in. There are many reds to choose from – depending on your preference and skin tone. Here are 3 staple reds in my pigment collection: a straightforward red (left), a deeper, wine-red, bordeaux (middle), and a brighter, pinkier, red (right). For my blush-and-lip mixture, I used the red on the left. Whiz until thoroughly mixed - adjusting the color as you go. When you're happy with the color, transfer to an airtight, dry container. Tip about mica: if you add a mica to a whizzing apparatus, you may well discover it looses the inherently glittery quality mica offers. To retain the reflective quality of the mica, you're going to have to dump the whizzing apparatus and instead SIFT the colors together until thoroughly mixed. Be forewarned: this will take a bit of patience. Expect to sift everything between 15 and 20 times before the color is even. Here's where you are can start experimenting and playing. You'll be adding brown oxide and/or sienna oxide to go darker – depending on how warm you want the color to be. Mix thoroughly in the whizzing machine, test the color and adjust until you have a tone that you like for sculpting. I use my darkest tone predominately for contouring the eye area. When you're happy with your pigment mixtures, transfer them to clean, air-tight containers and label them with date. If you've been good about keeping notes as you adjusted the colors, you might want to add that info to your label so you have a starting point for recreating the color. 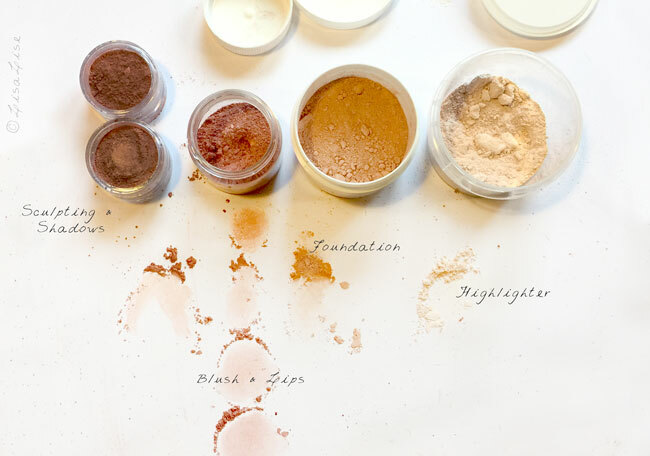 Next time we look at making make-up, we're going to create a pressed color skin tone palette. Do you make your own foundation and eye shadows? How do you mix your skin tones? Hi, Lise - What kind of mixing aparat you have there? And where did you get it? I know Marie Reyma uses coffee grinder, but I haven't found any from here. You can also use one of the personal size blenders, like the magic bullet. The basic idea is that you want to use a sharp blade, moving at high speed, in a small, dustproof container. Anything that fits the description can be used: coffee grinders, spice grinders, mini food processors, kitchen blenders, even miniature versions of professional equipment: http://www.amazon.com/CapsulCN-Machines-V-Blender-Pharmacy-Compounding/dp/B00D06Q99W. Dear Lise, thank you for sharing your wonderful wealth of wisdom, I love your blog! Can I mix in the mica using a mortar and pistel? Or is that essentially the same as blending it, do you know?